Bill Hybels is pastor of the American mega-church Willow Creek. Recently Jono and I read his book Courageous Leadership for our professional development as church leaders. I found the book to be very good! Hybels has many great tips and much wisdom from his many many years as the leader of his church. Particularly interesting to me were his Chapters on turning vision into action and the art of self leadership. His chapter on different ways to grow and nurture your walk with God was also encouraging and I have since bought the book he recommends by Gary Chapman - Sacred Pathways. There was only one weakness and that was the chapter on characteristics a leader should have (Ch 10 - A Leader's Prayer). In it he gives different characteristics a leader has by telling stories about Bible figures. I thought he needed to go the other way, give the characteristics and then give biblical and other examples. So it's a minor fault really. 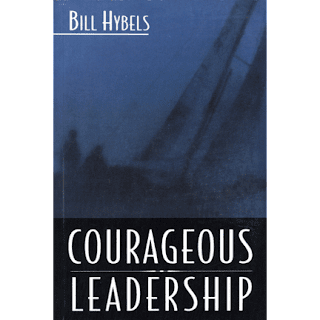 I definitely think even though this book is pretty old, and no one seems to care about Hybels and Warren these days (it's all about Driscoll and Chandler and Piper) all of us involved in some sort of church or church ministry leadership should give this book by Bill Hybels a read! Like you, I struggle at times with Hybels' use of the Bible and I do find that he tends to go on a bit. But when it comes to people or character, his stuff is one of the first places I turn. I reckon there's a lot to learn from his pastoral heart. shouldn't you guys be studying or something? ?